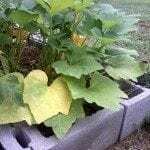 In our little backyard garden, our yellow crooked neck squash are dying. It appears to be occuring at the base of the plant. The plants have gone from a beautiful green and yielding good squash to wilting and dying.